As Cody and I packed our bags for Helen, GA, home of the annual Southern Wörthersee, we knew it'd be a weekend finely balanced between work and play. In and amongst catching up with friends and general shenanigans, there'd be a show to attend and more importantly, cars to shoot. Rion Morse's bagged E30 has a rather impressive following, amassing more attention on facebook than almost any other car we've posted in recent times. As one of the rare chances we'd find ourselves together with Rion and his creation, Cody and I wasted no time snapping away at a car we know will tickle the fancy of the StanceWorks community. Rion's passion for cars began before he found his way in to this E30. When Rion was 15, his father gave him one of his project cars, a 1972 Volvo 142S. Quality wrench time with his father and grandfather grew into an undying love for all things automotive. He still has his Volvo, a prized possession of sorts, but these days he considers himself a BMW guy. Or more fitting, a vintage BMW enthusiast. And his soft spot? 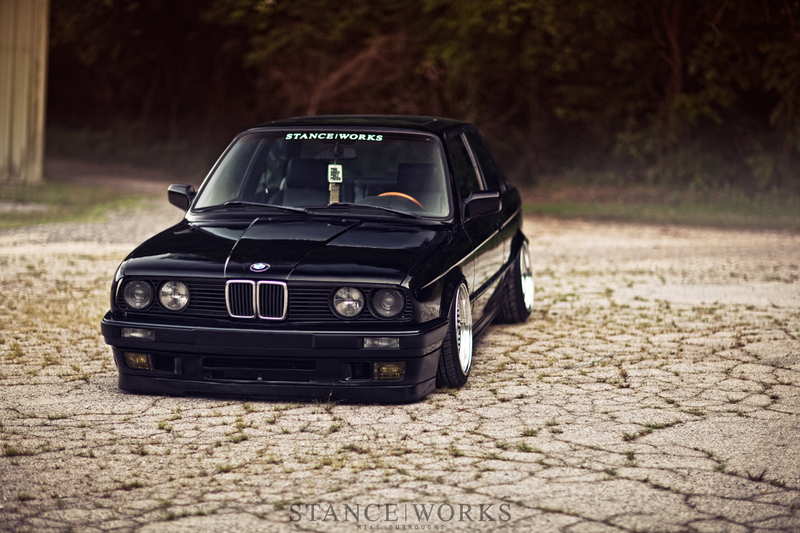 The E30, of course. The E30's cult following is largely based around the car's small size, good aesthetics, and most importantly, its incredibly capable performance. 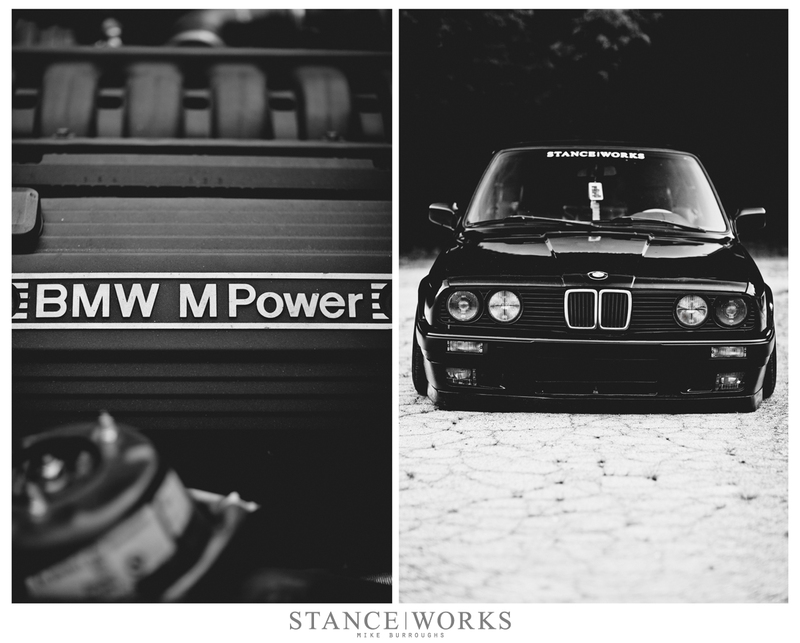 The E30 makes for an outstanding track car, be it for a weekend warrior or spec racer. 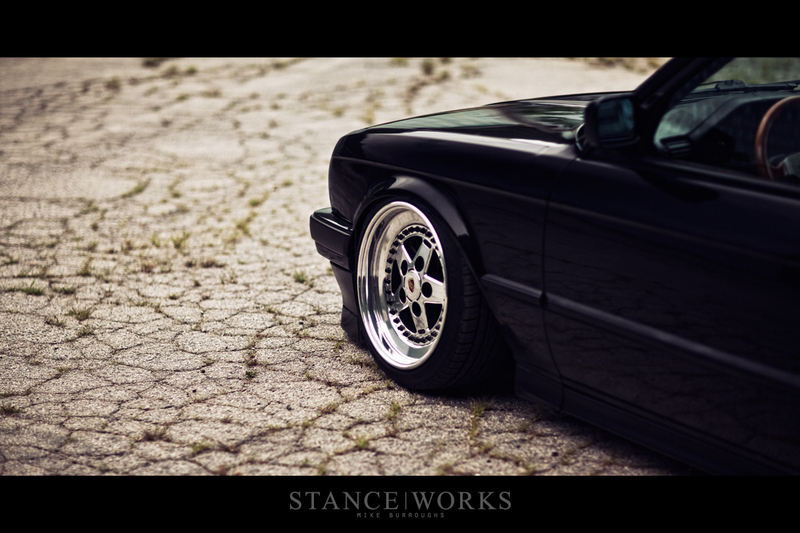 It comes as no surprise then that much of the E30 community doesn't take well to air suspension installations on their notoriously performance-based cars. Rion, however, has taken the opposite approach to his 325. As a whole, the aging car has been taken in a modernized direction. "The idea of bags just came up one day and I'd seen it done on a couple of E30s. If you've ever been to Savannah, you know being static is a death wish. After busting the pan and having to pull the entire motor and transmission to replace it, I knew it was time. I went with the cheaper bag over coil route because the E30 kits are outrageous right now and I knew I could get it done." The practicality of air suspension is inarguable, yet remains the topic of heavy debate. Many view bags as a sacrifice of performance in every aspect, while others see it as an improvement to nearly all facets of the driving experience. Rion was tired of tearing up his car, and instead of keeping the community happy by leaving the tried and true springs under the car, he went with a bag-over-coil system. Universal Aero Sport bags in the front and Air House 2s in the rear mounted directly to the old spring perches allow Rion's 325 to sit right down on the tires. His driving pressures set the car at a height that both looks astounding and performs well, and with just a bit more air, he was able to carve the mountain roads that dive down in to Helen... a far cry from bashing frame rails and smashing oil pans. To add to the fun of carving the curves is a 24-valve swap. An S50-cammed Vanos M50 gives the chassis a breath of fresh air and quite a bit of oomph to keep up with today's machines, and a custom shortened oil pan gives added clearance to the precious heart. The modern amenities are carried throughout, on to the inside of the car. 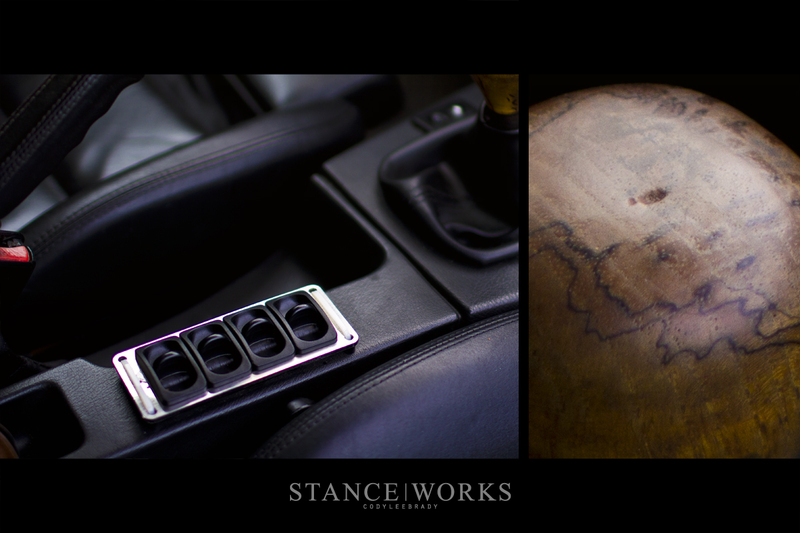 E36 M3 sport seats replace the stock E30 counterpart, and a Momo Veloce woodgrain steering wheel accentuates a one-of-a-kind wooden shift knob crafted by Rion's girlfriend's father. The paddle valves for the AirLift manual management setup sit just in front of the e-brake, and 3 gauges sit below the AC controls to let Rion know how every part of the system is functioning. The Gotti 55a wheels compliment the car astoundingly well. "I started my Gotti craze with a 2 piece set I found off of the forums and refinished. I have always loved the 3 piece 55a's a lot more, so I kept my eye open for them as they popped up. I eventually found some that needed some polishing work and turned out to be absolutely perfect." The 16x8 fronts clear the bags on the inside and meet the fender perfectly while the 10" wide rears stuff the rear fenders to their limit. Originally built for a Porsche, a set of Adaptec USA adapters gives the wheel a new home, crossing brand lines and ensuring ruffled feathers in unison with the unwelcome suspension. Rion's struggling with making the decision of whether to paint the car or boost it. A redone trunk and a cleaned up engine bay are certainly in the near future, but Rion acknowledges that the project is, in some sense, indefinite. However, it's a project that blends multiple styles and multiple cars together successfully. Its one of the few bagged E30s stateside, and there's little question that its one of the best executed... and last but not least, it's a car Rion drives every day. We're eagerly anticipating what Rion comes up with next.